Is there no end to the fabulous places to eat in the wonderful medieval town of Annecy in the heart of the Haute Savoie? - that's a rhetorical question... it would seem not! 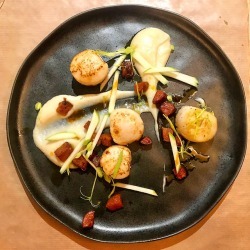 some of these culinary treasures are so well hidden, you need a local to give you the 'heads up' and the owner of one of my favourite Annecy restaurants Le Bilboquet told me about this one. My latest find is Restaurant L'Esquisse in Annecy owned by Stéphane and Magali Dattrino. Situated on the Rue Royale in the centre of Annecy, this little gem and it is a small restaurant takes only 18 covers for each sitting in the calm and tastefully decorated restaurant. Stéphane was the second chef to Laurent Petit for 7 years at Clos de Sens in Annecy le Vieux before opening L'Esquisse in 2011. And it was in 2016 that he earned his first Michelin star! It's easy to feel the passion in his food creations, the marrying of great flavour combinations, beautiful plating and delicious tasting food! Magali is front of house to greet diners gives such a warm welcome. I loved her friendly chat whilst discussing the menu and serving Stéphane's delightful creations, you could feel her pride in presenting the 'fait maison' and beautifully presented dishes. L'Esquisse offers four menu options - at weekday lunchtimes the L'Instant du Midi which is a three-course lunch for €36. The Expression Gourmande can be chosen from an entrée, fish course and main dish - 2 dishes, cheese, dessert for €62 or 3 dishes, cheese, dessert at €72. Then there is L'Inspiration menu which I really enjoyed, all of the decision making is taken away! Stéphane will propose a gourmand surprise discovery of either a 4 or 5-course lunch or dinner - including cheese and dessert. If the whole table chooses to indulge in the art of surprise try the Menu Sensation for a real gourmet experience, a seven-course tasting menu for €82. The attention to detail and distinctive serving dishes and cutlery just add to the whole dining experience. The polenta strips were an inspired idea and the flavoured butter such an interesting addition. I so enjoyed the intimate dining experience that this restaurant has and the idea of the inspiration menu creates a culinary discovery with the element of surprise! I've visited three times at lunchtimes and loved it. A fine dining experience in between what is always a wonderful day wandering the shopping streets of Annecy. The Opinel Knife was invented in the Savoie by Joseph Opinel in the 1890s. Pictured above is the iconic design of this knife. Joseph originally designed 12 knives of varying sizes. The knife has a wooden handle and a distinctive virobloc twistlok invented by Joseph's son Marcel, which was added to the classic design in 1955. By this time the factory had grown and moved to Chambery. The Opinel museum is located in Saint-Jean-de-Maurienne on the original site of the founders workshop. To this day it is run by family members and in the old town of Annecy, the first dedicated Opinel boutique was opened in July 2017. Have you been to L'Esquisse? what did you think? Where else in Annecy have you eaten? I'd love to hear your comments. You will find Restaurant L'Esquisse at 21 Rue Royale in Annecy. they are open every day apart from Wednesday and Sunday from 12h15 to 13h15 for lunch and for dinner from 19h30 à 21h. I would highly recommend booking in advance by telephoning +33 450 44 80 59. Click here to visit their website . I visited L'Esquisse restaurant at my own expense and these are my views on my dining experiences. Thank you for sharing your experience at this amazing eatery! I loved the inspiration menu and the element of surprise! The Opinel knives are really great, come in all sizes and colours and make great gifts. 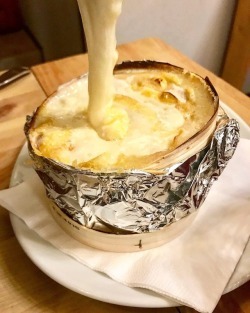 I’ve not yet visited Annecy but judging from the food at L’Esquisse, I need to add it to my wishlist ASAP! The small size makes it even more appealing, and clearly the owners focus their energies on making it perfect for just 18 guests at a time! The fixed menus sound like a particularly good deal for this kind of cooking! I think you would love Annecy! You’re right the attention to detail in the food is wonderful as are all the flavours!